By Chris Williams on July 25, 2014. Fleas are not microscopic, they’re small but they can be seen with the naked eye. Of course, if you have a microscope or magnifying lens, it will be easier to see some of the features I’m going to mention. The adult cat flea (the main flea on pets) is about 1/8 inch long and will be burrowed down at the base of the hairs on your dog. Don’t even bother to look for adult fleas anywhere else because they rarely leave the animal. If you can find a flea, it’s hard to get it to sit still long enough to get a look at it. If you try to grab it and it jumps, that’s a positive clue. Fleas have long, well-developed hind legs with thick “thighs.” The better to jump, my dear. Adult fleas are brownish-black to black in color, and become reddish-black when full of blood. Fleas are laterally flattened which means that if you looked down on one from above, it would appear very narrow. This shape lets them maneuver through the dense hairs on an animal. You may have been looking at flea larvae for some time without realizing it. Flea larvae look nothing like the adult flea. They are whitish and wormlike and about ¼ inch long when mature. They have a noticeable brown head but are eyeless and legless. Flea larvae are so small that you might dismiss them as lint or debris unless you see them wiggle. It’s easy to miss a single flea larva. Fortunately, they are usually found in bunches in places where your pet sleeps. They may be burrowed down into carpet or other textured materials. A Sprinkling of Salt and Pepper? When you find a bunch of flea larvae, you will also find a bunch of flea feces. These are small black specks of digested blood defecated by the adult flea, and which provide food for the larvae. Along with the white flea larvae, you may find white flea eggs, shed larval skins, and white pupal cocoons. These are sometimes collectively referred to as “salt” and the black flea feces as “pepper” and together are a reliable clue that you have a flea infestation. If you determine that your dog has fleas, treating him alone will not eliminate your flea problem. It’s important that you also have your home treated to kill those flea larvae that are still developing off of your dog. 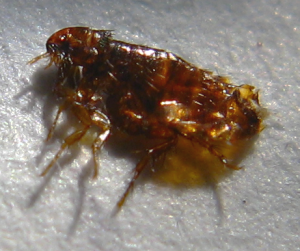 See “Sorry Worcester…You Have Fleas!” Give Colonial Pest a call today for prompt flea service.